Your septic tank is a key component of your water treatment and recycling system. It serves as a settling basin where solids accumulate and gradually get broken down by bacterial action. Some of the organic waste (the organic fraction) is actually liquefied by this “natural bacterial decomposition,” however the rest of the waste accumulates in the bottom as a layer of sludge. Additionally, a small percentage of this waste (mostly fats and oils) may float to the top of the tank to form a layer of semi-solid scum. The population living in metropolitan areas (who have never had the pleasure of maintaining a septic system, or who have never experienced waddling in their leach field, or even had the experience of pumping out their systems) simply flush their toilets and “away go troubles down the drain.” However, most of these people pay a monthly waste water bill, usually between $50 and $150, for this service. 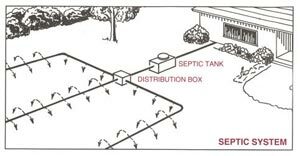 Those of us living in more rural areas have been forced to learn about the maintenance and working of the sewerage treatment facilities attached to our homes, “the septic systems.” Usually a septic tank is connected to a drainage field or seepage pit of some kind. If properly maintained, a well-designed system will last almost indefinitely. 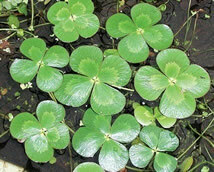 However, if it is neglected for too long a time, it can back up and clog the drainage field. This neglect can result in an expensive excavation and even a replacement of the drainpipes that could cost thousands of dollars. 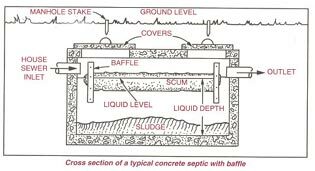 Since solids will continue to build up at the bottom of the tank, it is imperative that the “septic tank be pumped out periodically.” Remember, the inorganic fraction of the sludge is not biodegradable, if it’s not pumped out; sludge will accumulate until it overflows where it can cause problems in the leach field. Since solids will continue to build up at the bottom of the tank, it is imperative that the “septic tank be pumped out periodically.” Remember, the inorganic fraction of the sludge is not biodegradable, if it’s not pumped out, sludge will accumulate until it overflows where it can cause problems in the absorption field. 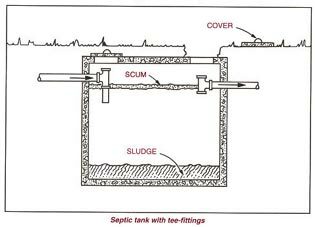 It is important to get the septic tank cleaned before the sludge level gets high enough so that any of the solid material at the bottom, or the semi-solid scum at the top can flow out into the drainage field. This will quickly clog the drainage pipes and the soil into which they drain. If this happens, the only cure would be to dig up and replace the entire drainage field. Another option would be to treat the system with the bacteria found only in PRO-PUMP™. These special microbes have been proven effective for over 20 years to remediate percolation problems in soil with organic build-up (if the soil is plugged up with inorganic solids, biological additives will not work). Please remember that PRO-PUMP is a natural product and needs some time to work. Unlike chemicals, which are harmful to the environment, the natural and safe bacteria in PRO-PUMP multiply over time. Make certain there are live bacteria in your system at all times. The bacteria’s job is to digest most organic waste matter in the system. If there is no bacteria in you system, it will simply act as a holding tank for your waste. If it becomes full, natural digestion will not occur. That is when the system backs up. Excessive quantities of detergents, laundry waste, bleach, household chemicals, and caustic drain openers. Garbage disposal grinds, which substantially increase the accumulation of solids. Even though they are mostly organic, they break down slowly and can cause problems before they completely break down. Disposal of excessive amounts of grease and fats, which are biodegradable but need but need particular types of bacteria to digest them efficiently. Oil grease-degrading bacteria can help with this. Disposal of cigarette butts, sanitary napkins, which are also biodegradable but are not readily decomposable. Too many people using a smaller/inadequate or failing system. If you have no bacteria in your system and you add enzymes to the system, it simply will not help and your system will still not work. Enzymes are simply catalysts produced by bacteria. If there are active bacteria in your system, why use enzymes? From time to time, you it may be necessary to add “100% naturally occurring LIVE BACTERIA” to your system. Our qualified technicians can help you determine what is best for your system.